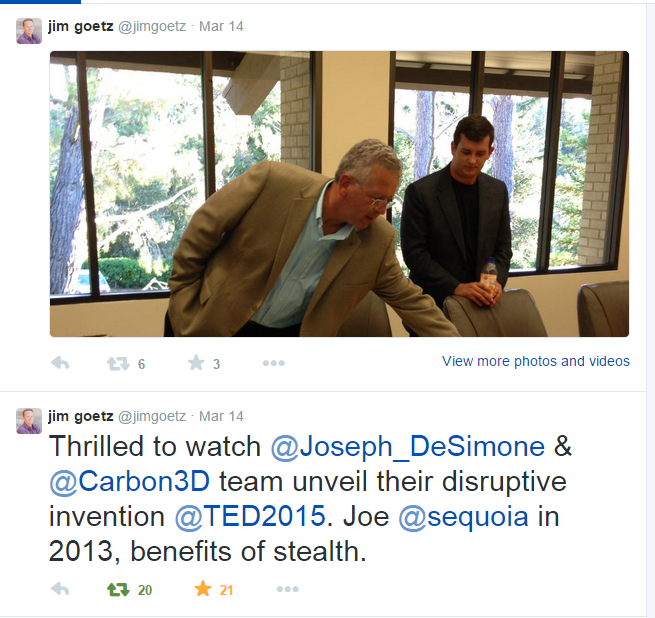 When Joe DeSimone takes the stage in Vancouver at TED2015 tonight in the opening gambit he will be publicly introducing the world to Carbon3D, a stealth (Sequoia) venture backed company whose technology and impact might ultimately be as impactful Chuck Hull’s original invention of stereolithography process for additive manufacturing. The Carbon3D founding team of Joe DeSimone, Alex Ermoshkin, Ed Samulski and Phil DeSimone originally started the company as EIPI Systems in Chapel Hill, NC in mid-2013. Along the way they took investment from Sequoia and others and have been joined by an incredible group of leaders from within and outside the Bay Area. Speed – their process currently allows them to print at 50x – 150x the speed of other methods, so fast that “little” problems like heat need to be managed. It is a sight to behold. Materials – given that the founders have incredible chemistry backgrounds, it shouldn’t be surprising that they are focusing as much on materials, and the science behind them, as their device. The result? Incredible engineered materials with material strengths simply not possible with existing techniques. Surface Finish – imagine if you could produce surface finishes approaching that of injection molding without post processing? While the Carbon3D team continues to develop their technology and expand beyond the pilot phase, the future sure does look promising. Previous PostIntellectual Property in the Coming World of Distributed Digital ManufacturingNext PostParacosm Seeking CV/CG Engineers and C++ Developers!